As per USDA, U.S corn exports reached 14,048,329 metric tons in the 2015-16 marketing year. At 8,70,660 MT (for the period 12th Feb- 18th Feb, 2016) exports were up 19 percent from the previous week and 36 percent from the prior 4-week average. The primary destinations were Mexico (353,200 MT), Japan (248,600 MT), Colombia (182,300 MT), South Korea (58,100 MT), and Taiwan (11,700 MT). Total Rice exported from India in the third week of February was 171893.14 tons out of which basmati rice contribute 46.02%, and non-basmati rice is 53.97% in this period with quantity of around 79106.46 tons and 92786.68 tons respectively as per latest data extract from IBIS. Major importers of Indian Basmati rice in this period were, Kuwait, UAE & Saudi Arabia. We expect Middle East countries to remain the major basmati buyers of Indian Basmati from Mundra, Kakinada and Kandla Port in coming months. Major non basmati importers were Benin, Ivory Coast, & Cambodia. Total rice exported was up by 5.6% from last week export of 162753.4 tons. Buyers should start procuring seed around Rs 2800/2900 per qtl for stock purpose. Future prospect for good return seems in the second half of the year. As oil export has been higher than normal pace, almost 80 percent old stock seems to be consumed so far.Major dip from current level is unlikely. Government’s rice procurement has increased 21.47% to 26.98 million tons in the 2015-16 marketing year so far despite prospects of lower production due to poor monsoon. The Centre has kept rice procurement target of 30 million tons for the current marketing year, which started in October-2015. These agencies had procured 22.21 million tons a year-ago, while the total purchases had reached 32 million tons. At present, procurement has been completed in Punjab and Haryana which is up by 20% and 41% respectively with quantity of 93.50 lakh tons and 28.60 lakh tons, while the operations are in full swing in Uttar Pradesh, Chhattisgarh, Andhra Pradesh and Telangana. As per the government’s latest data, rice procurement in Uttar Pradesh has risen to 5.97 lakh tons so far this year as against 4.29 lakh tons a year-ago. Procurement in Chhattisgarh increased to 39.72 lakh tons from 33.54 lakh tons, while that of Andhra Pradesh has increased to 25.13 lakh tons from 12.71 lakh tons in 2014. Rice purchase in Telangana was lagging behind at 10.14 lakh tons so far this year as against 15.23 lakh tons in the corresponding period of the 2014-15 marketing year. As per Agriwatch production estimate, due to bad weather condition during flowering stage pepper crop reported damaged. Current year India’s pepper production expected to be around 52,000 – 56,000 tonnes compared to last year bumper production of 70,000 tonnes. Lower production expectations current year may support prices in coming days. Lower demand from domestic buyers and exporters in the spot market drag cardamom prices. Cardamom March future market down to Rs.654.50/- per kgs on Wednesday. Cardamom markets reported inactive as picking continued in fifth phase, lower quality material coming to the market during last picking; planters revealed. Agriwatch Cardamom (Continuous chart, C1) Monthly call target achieved. As per Monthly Technical analysis, cardamom sell below Rs.650/- per kgs with target1 Rs.610/- per kgs and target2 is Rs.600/- per kgs. Cardamom lower prices reported Rs.579.9/- per kgs. this month till date. Rajkot Castor seed Futures Closed slightly lower on profit booking and increasing expectation for higher arrivals with rising temperature in Gujarat maturity process would increase. Castor seed future March-June contracts eased from Rs3101 to Rs 2995 per qtl.Castor Seeds ready price quoted at 3,062.50 per quintal compared to the previousclosing price of 3,050.00 per quintal. At Warangal market, Red Chilli Teja is trading high at Rs. 12000-13100 per quintal, higher by 0.77 per cent from previous trading day. Red Chilli Wonder Hot is offered firm at Rs. 12500-13100 per quintal, higher by 3.97 per cent against previous trading day. Red Chilli 341 at Warangal market is quoted lower at Rs. 13000-14400 per quintal, down by 2.04 per cent from previous day’s price level. Red Chilli Denvor Delux at Warangal market is offered lower at Rs. 13000-13800 per quintal, lower by 6.76 per cent against previous day. Red Chilli Fatki at Warangal market is trading at Rs. 7000-9500 per quintal, unchanged from previous close. Gujarat Finance Minister presented a Rs. 1,51,852 crore budget for 2016-17 while announcing a scheme for wheat and rice for the poor at Rs.2 and Rs.3 a kg respectively.The state would now provide 35 kg of foodgrains per family living below poverty line. The lower middle class too would get the benefit of the scheme and can avail up to 5 kg of foodgrains every month. National Council for Applied Economic Researchhas estimated85 MMT wheat production this year from 2015-16 crop,lower by 1.5 MMT from 2014-15 crop.It is almost 8.5 MMT lower than estimate of 93.82MMT published in Second Adv Estiamte on 15.02.2016.The NCAER report released in January also said that India might not export any wheat in 2016-17 marketing year. However, because of lower procurement and strong purchases by private traders from October 2015 to March 2016, the total wheat stock in the Central pool might fall to 15 mt by April, which would be 2 mt less than the stocks during the year-ago period. In 2015-16 Coriander production (Agriwatch Estimate) expected increase by around 18 lakh bags (1 bag = 40 kgs) as compared to last year. No major crop damaged reported till now. Sources revealed that, in Madhya Pradesh districts like Neemuch and Mandsour yield little affected due to higher temperature during maturity stage. However, in major growing state like Rajasthan and Gujarat current year crop reported well, farmers expected good yield. Argentina’s soybean crop conditions are likely to get worse before it gets better on heavy rains in the key grain growing reasons. Rains which were considered to be beneficial for Argentina’s soybean crop reached to the levels which is abnormal. Six of Argentina’s key farm states are declared flood emergency areas by the government last week. Argentina’s is expected to receive about 4 – 5 Inches of rains in near-term. Arrivals of seed have started increasing in all major markets despite lower price. Pressure would continue to rise as higher arrival is expected in the weeks ahead. Stake holders would prefer to wait for stabilization in the cash market. Market participants say that arrival pace would increase as small farmers need money for various activities and they will continue to sell. Arrivals have increased in Patan ,Deesa and Sumerpur. It may expected to touch its peak around mid April.Total arrivals have croseed 35000 bags last week. Castor Seed Ave Price decreases By 3.66 % Week On Week Basis To Rs 2986.38 Per Qtl. Castor seed all India average price decreased by3.66 % to Rs 2986.38 per qtl week on week basis. It was being traded at Rs 3099.96 per qtl. during the week ended 15th Feb-2016. More dip from current level is likely as pressure from new crop would increase. However, any steep fall in cash market seems a remote possibility Current average price of seed is ruling lower by 13.79 % from mid Feb-2015. Unofficial preliminary rice exports (excluding premium white and fragrant rice) for February 8-14, 2016 totaled 132,703 metric tons, up 84,695 metric tons from the previous week and 40,159 metric tons from the four-week moving average of 92,544 metric tons . Rice exports from January 1 – February 14, 2016 totaled 532,658 metric tons, up 24.5 percent from the previous week. Cardamom production (Agriwatch estimate) may up to 24000 tonnes current year as compared to last year 22000 tonnes. Cardamom stocks reported higher in the spot market as production increased from last two year. Production increased in India from last two years due to favourable weather condition in major growing regions. For more details please visit Agriwatch Spices Report. During the last week (i.e. 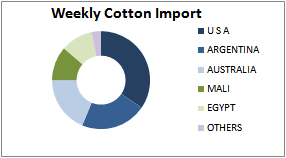 08 Feb-14 Feb 2016) India imported cotton from USA, Argentina, Australi a followed by Mali and Egypt. The respective volumes these countries exported to India during the week are 0.045 lakh bales, 0.028 lakh bales, 0.024 lakh bales, 0.015 lakh bales, 0.014 Lakh Bales. 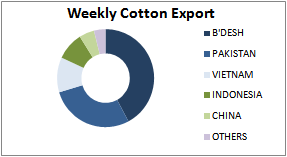 Major importer of Indian cotton during the week was Bangladesh. According to the data released by IBIS, Bangladesh imported 0.76 lakh bales of cotton from India in the past week (08 Feb-14 Feb 2016). Other major importers were Pakistan, Vietnam, Indonesia and China and their imported volumes were 0.50 lakh bales, 0.21 lakh bales, 0.17 lakh bales and 0.09 lakh bales respectively. India exported 1.794 lakh bales of cotton last week (08 Feb-14 Feb 2016), which was 2.29 lakh bales previous to last week (01 Feb-07 Feb 2016), according to the data released by IBIS and compiled by Agriwatch. Imports on the other hand stood 0.129 lakh bales last week, which was 0.104 lakh bales previous to last week. Cotton yield in China in falling with the rate of 9.3 percent every year, said National Bureau of Statistics. Due to the fall in the yield and acreage, cotton production in China is likely to lag by 5.74 lakh tons in 2015, said NBS. Cotton acreage in country fell by around 10% to 37.99 lakh hectares in 2015. Thailand MY2015/16 rice production is revised down to 15.9 million metric tons which is a decline of 18 percent from last year. 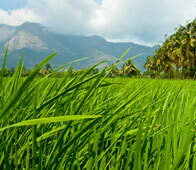 This is due to an acreage reduction in off-season rice which is adversely affected by limited irrigation availability. Rice exports totaled 9.8 million metric tons in 2015, down 11 percent from the previous year due mainly to a reduction in parboiled rice exports. Brazil rice stocks stood at around 110,388 tons in January 2016, down about 4% from around 115,126 tons in December 2015 and down over 50% from around 240,544 tons in January 2015, according to the country’s national grain supplying agency Conab. India exported around 988 lakh Kg of cotton yarn in December 2015 which was distributed in 76 countries. The value of the volume was USD 26.60 crores (approx Rs. 1760 crores). During December, China stood as major cotton yarn export destination of India. As prices of oil is ruling lower India has exported 10014 tonne oil last week at an average price of $1193.83 per tonne. Major buyers like China,EU and others are covering their lonf period needs as they are not sure about price. They think it may recover after April. As they are covering their long term demand , they will buy at lesser quantity in in the last phase of second half.This may restrict seed market to recover smartly. Castor seed markets tardes under pressure on expectation of higher supply in the weeks ahead. However, farmers may retain stock as prices are ruling lower.Oil export is on full swing as major stake holders are releasing stock and till April 90 % of old stock might be sold out.Farmers would not sell at lower level and old stock would end by April . So Agriwatch see recovery in seed market after April. Seed stockiests should buy in the range of Rs 2800 to 2850 per qtl. Jeera March future market up by 2.15% (High –14315/Qtl) on Tuesday. Area under Durum wheat in M.P. is increasing continuously and the increasing trend may continue as private sector companies demand for durum wheat is growing faster than normal pace.Durum wheat is also known as MAlvi wheat.Durum wheat is being used for making different types of pasta,which is hard and rich in protein.other varieties lacks these quality. The area under cultivation of durum wheat in MP has increased nearly seven-fold to 13% of the total wheat area from 2% five years ago.Its yiel is higher than sharvati and yield around 55 to 65 qtl. per ha.The milling of other varieties of wheat breaks down the endosperm, resulting in fine, powdery flour that is suitable for baking products such as breads, cakes and cookies. As per the latest update by ABARE wheat production in Australia touched 24.2MMT for 2015-16 season.It is 1% higher than the estimate released in December-2015.Its previous 2015/16 production estimate was 23.98 MMT.Higher production in Australia increased global supply and prices decreased to five year’s low.New palnting in Australia would start in April for 2016-17.